Overlooking a wide sand beach, Scarborough (pop. 59,000) is the oldest coastal resort in England. Renowned for its spa since 1620, it became the first popular place for sea bathing in the mid-18th century and was nicknamed the "Queen of the Watering Places" in Victorian times. 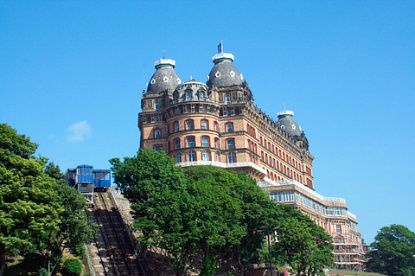 Nowadays, Scarborough competes with other tacky holiday resorts like Blackpool or Brighton, and even if the North Sea waters are colder, it makes it up with its gorgeous Georgian, Victorian and Edwardian architecture. 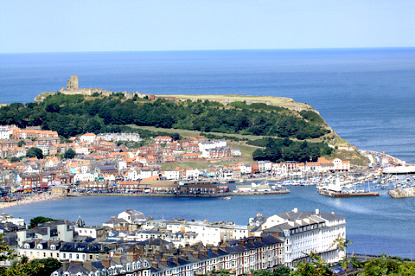 Settled since the bronze age, Scarborough was founded by the Viking Thorgils Skarthi ("the harelips") around 966 AD as Skarðaborg. The town acquired its stone castle in 1130 and was granted charters by Henry II in 1155 and 1163, permitting a market on the sands. This developed into major 45-day event known as the Scarborough Fair, starting on 15 August and attracting traders from all over Europe, as well as jesters and jugglers. The famous traditional English ballad of the same name (arranged in the 1960's by Simon and Garfunkel) is believed to have originated in the 16th or 17th century. The fair continued until the 19th century. Apart from the beach itself, the main attraction are the ruins of Scarborough Castle, perched on a rocky outcrop some 100m above the sea. The castle was left in its present state after the English Civil War, but still offers great views on the town and beach. Anne Brontë (1820-1849), both of whose novels were set in Scarborough, is buried in the graveyard of the old St Mary's Church at the foot of the castle. Scarborough has its own Sea Life & Marine Sancturay, of the same group as those of Brighton, Weymouth, Birmingham, Blackpool and Great Yarmouth. This one specialises in Jurassic Seas and the World of the Octopus, and also has numerous penguins, otters, sea turtles and a seal hospital. 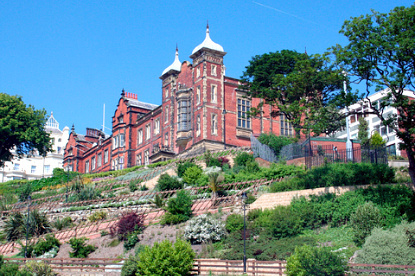 Other sights include the Rotunda Museum (local history), the Scarborough Art Gallery, the Wood End Museum (natural history) and the Windmill Hotel's Toy Museum. Scarborough is located on the north coast of Yorkshire, halfway between Bridlington and Whitby, about 50km north-east of York. Trains between Scarborough and London (3h20min, super advance single £58) require a change at York (45min, £12.40). There are also direct services to/from Leeds (1h15min, £17.20) and Kingston-upon-Hull (1h25min, £10.80). National Express has one direct bus daily between Scarborough and London (7h15min, £25.50), and regular services to York (1h40min, £5.50) and Leeds (2h40min, £6.50). 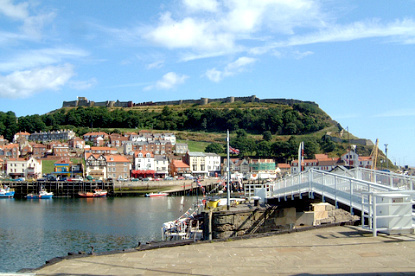 There are frequent local buses to Pickering, Whitby and Robin Hood's Bay.